National Volunteer Week is April 7-13, 2019, and is celebrated by countries all over the world as an opportunity to thank volunteers worldwide and encourage additional activism from communities and organizations. 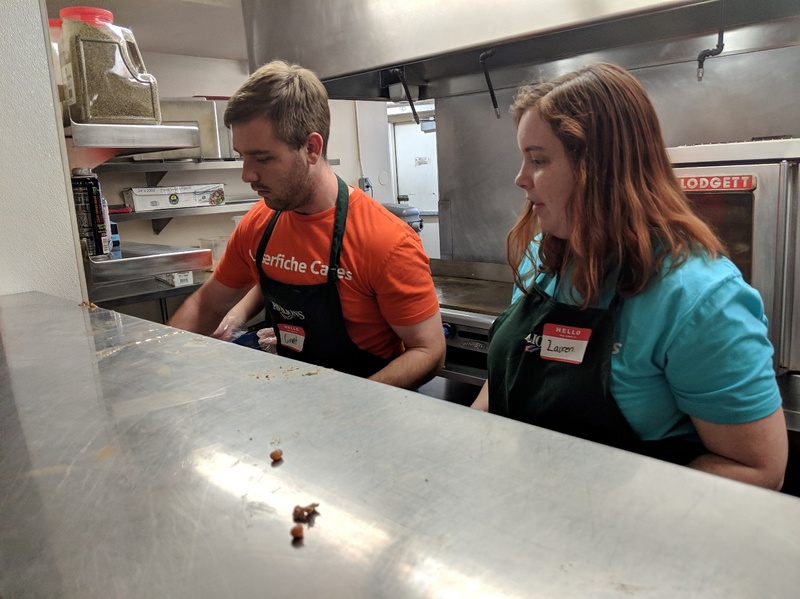 At Laserfiche, we’re proud to sponsor regular community outreach efforts and participate in local volunteering opportunities with our team through the Laserfiche Cares program. 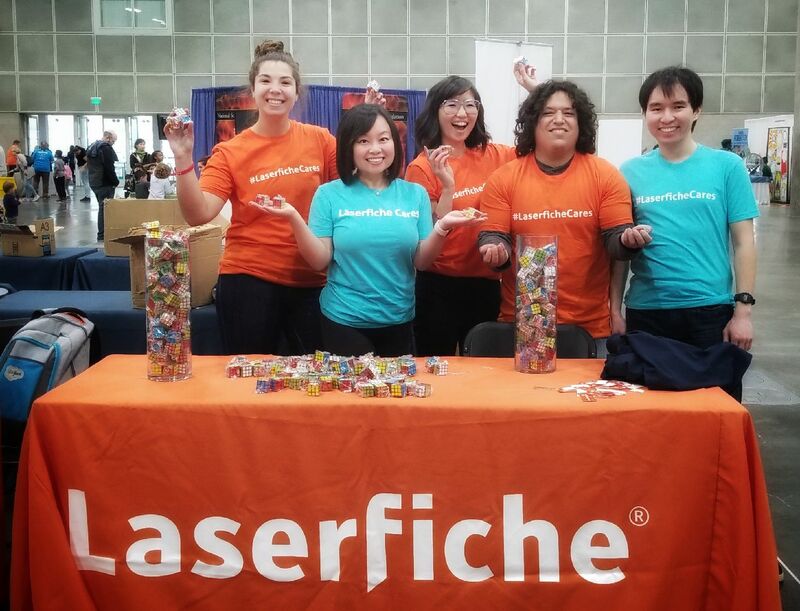 Laserfiche was a proud sponsor of the Clippers SciFest Socal, where our team shared their tech knowledge with kids and their families to develop critical thinking & problem solving skills through fun activities, demos, and friendly competitions. What is your favorite way to volunteer/give back to the community? “My favorite way to give back to the community is volunteering at the Long Beach Rescue Mission. The reason I enjoy this one so much is because it is eye opening in so many different ways. The Long Beach Rescue Mission provides food, clothing, shelter and guidance to men, women and children in the local community. The Laserfiche team regularly volunteers during evening meal services. If you could choose any volunteer opportunity to participate in, what would it be? 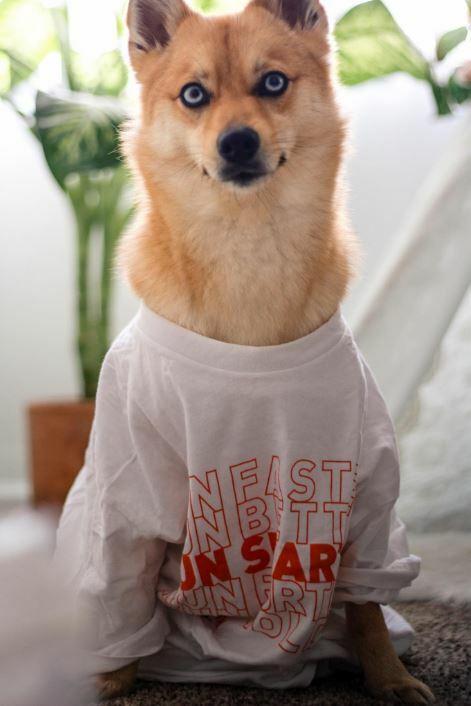 “I’d really love to volunteer with the elderly with the help of my pup, Nala. When I was younger, I used to volunteer with my poodle and take her to nursing homes to visit with the residents. It was always so rewarding to see how excited the community was when it was visiting day; I would do different tricks with her and sit and talk to different residents about their experiences and stories. Pups like Kasama (above) can bring a smile to those in need of companionship, such as nursing homes and hospital wings. Bonus points to Kasama for her Laserfiche team spirit! If you could name one volunteering “role model” you admire, who would it be? “My mom is my volunteering role model. She both taught and showed me the importance of volunteering. She worked full time, but would always help out with my school in whatever ways she could—most of the time, that meant after hours with the PTA or helping our ‘room mom’ with projects that she could work on at home after work. This taught me that no matter what is going on in your life, there is a way to help others for the greater good. 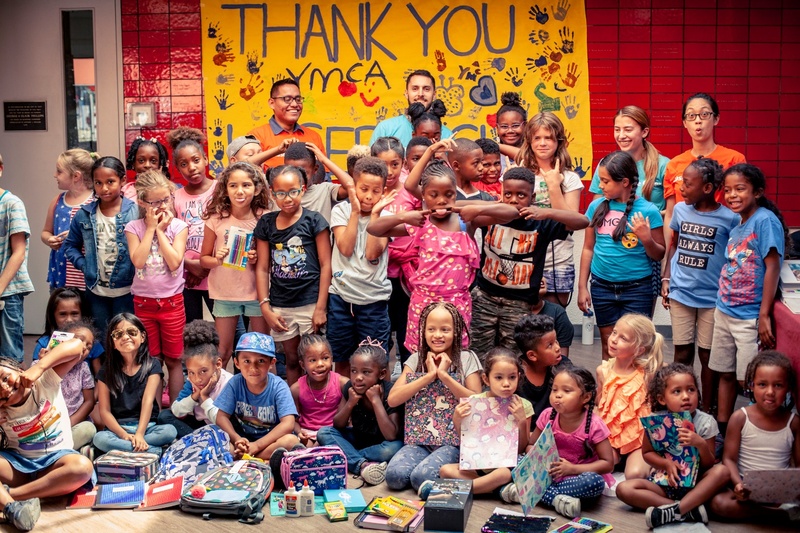 Laserfiche employees participate in semi-annual donation drives to provide necessities and gifts to organizations such as the YMCA of Greater Long Beach, whose young students enjoyed their school supplies for the 2018-2019 school year! What is your favorite volunteering experience you’ve ever had? “My favorite volunteering experience is helping build homes for Habitat for Humanity. I enjoyed being able to donate my time and construction experience to help a program build homes for those in need. 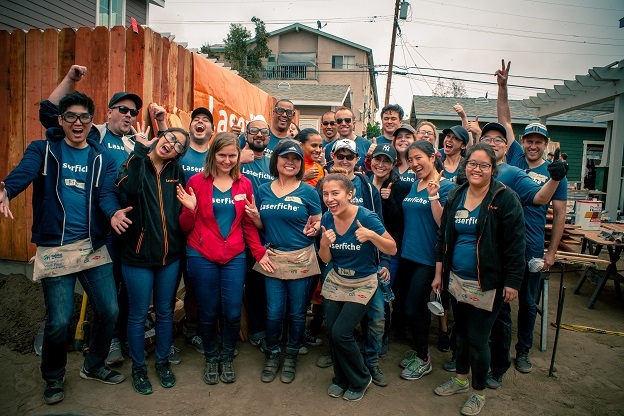 The Laserfiche team partners with Habitat for Humanity LA to regularly participate in local home-building events, where we get our hands dirty helping to construct homes for local families in need. 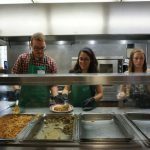 Why is it important for organizations to volunteer/give back to their community? 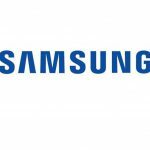 “Companies are vital to communities for jobs and revenue creation. To be a good community citizen, to ‘do good,’ and then some, companies need to holistically look at how they affect various stakeholders in their universe. 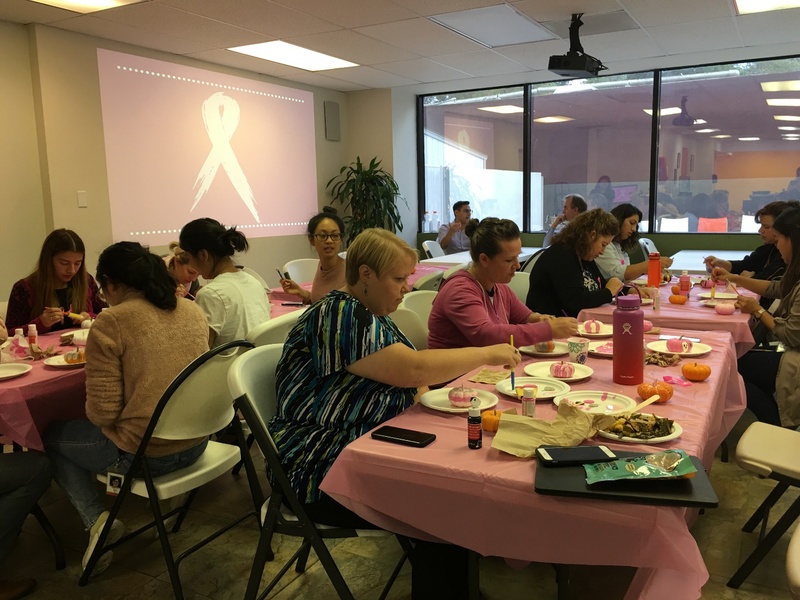 Laserfiche hosts company-wide activities to spread awareness, education, and support for causes important to our community, such as Breast Cancer Awareness Month each October. By initiating Corporate Social Responsibility (CSR) activities, companies can inherently support the communities they touch, rally employee morale, and improve their overall reputation. How can you encourage others in your organization to get involved in volunteering? “1. Inspire by doing. Anyone who is already passionate about volunteering can inspire others just by doing what they love to do. Of course, this also means you need to make your activities visible—either through taking photos and sharing them on any relevant social media or just by talking about what you do whenever you get the opportunity. Sometimes this is the most important part just to create awareness! 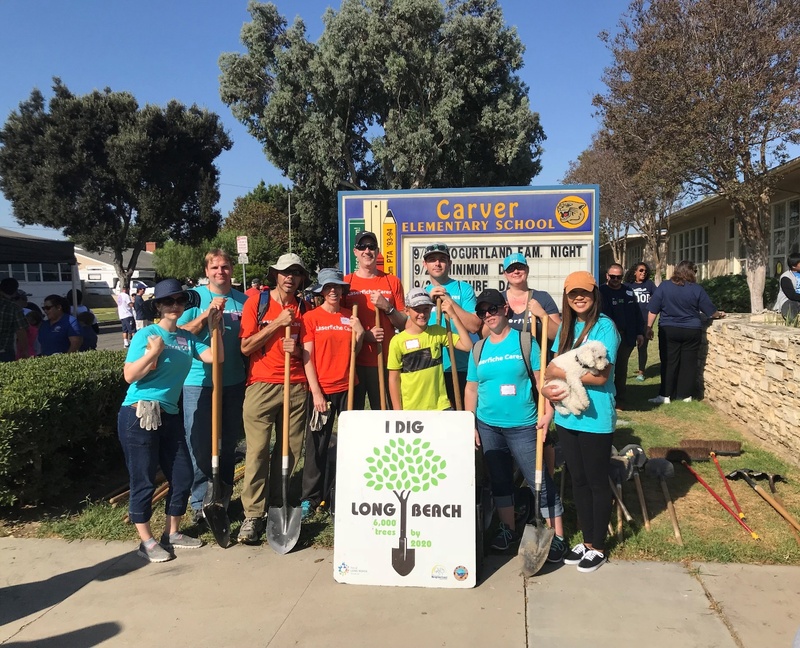 Laserfiche partners with local programs such as the “I Dig Long Beach” initiative developed by the City of Long Beach, which enlisted local volunteers to plant trees in urban neighborhoods for improved shade and air quality. 3. Make it cool! Those who are already volunteers know what the value is, but sometimes to catch other people’s interest it really helps to do something that makes the volunteer group at your organization stand out and highlights the value you get from participating. 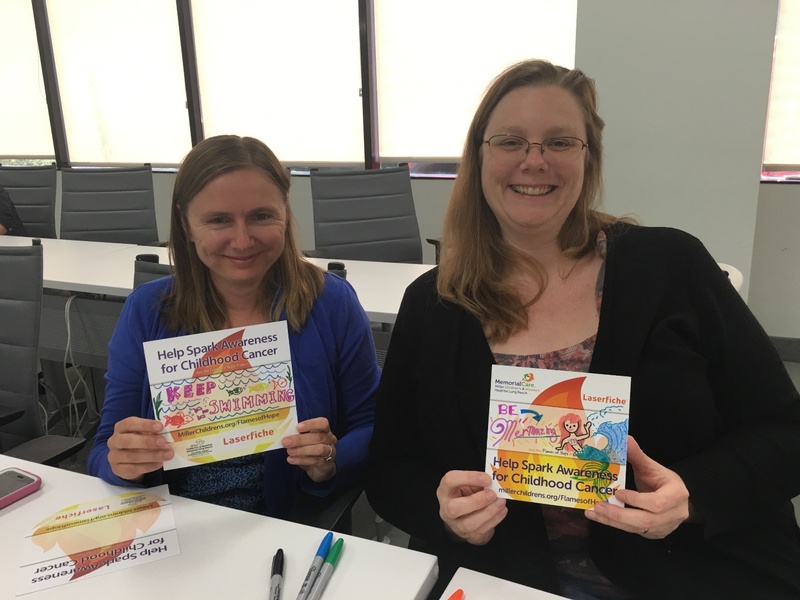 Laserfiche employees enjoy participating in programs such as the Long Beach MemorialCare “Spark Awareness for Childhood Cancer” project, which encouraged individuals and organizations to create notes of support and encouragement for young patients and their families. On behalf of the Laserfiche team, we’d like to encourage all of our readers to make an effort to celebrate National Volunteer Week by donating your time, efforts or means to support the needs of your local community. 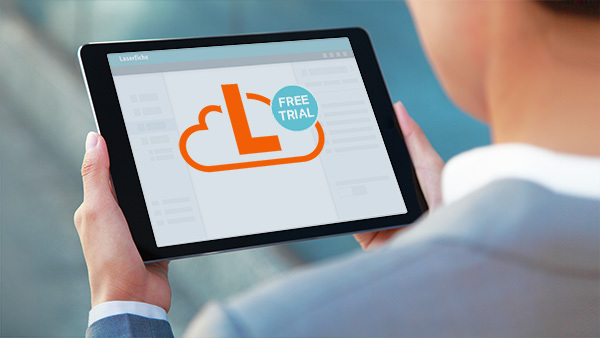 For additional inspiration and ideas to get started, visit our Laserfiche Cares homepage. Interested in becoming a part of our team? 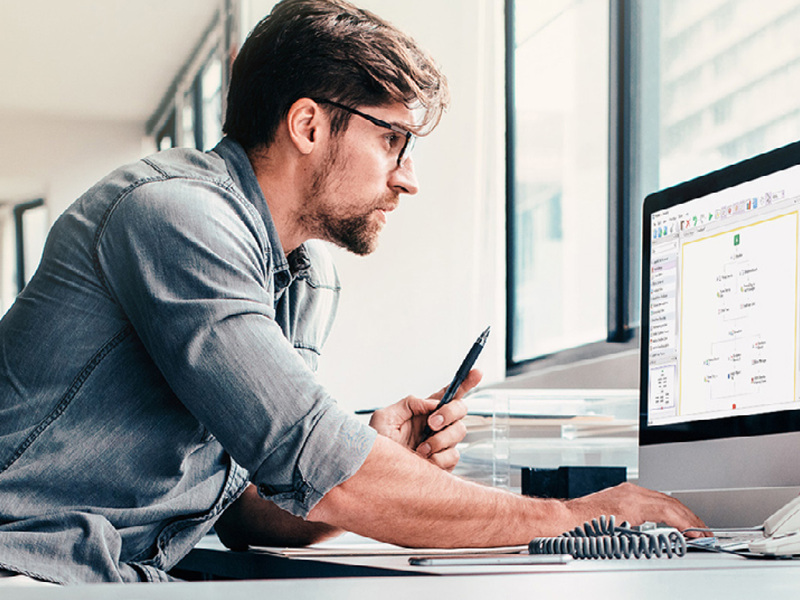 Learn about opportunities at Laserfiche.